Awesome Christmas stocking for the saltwater fisherman. 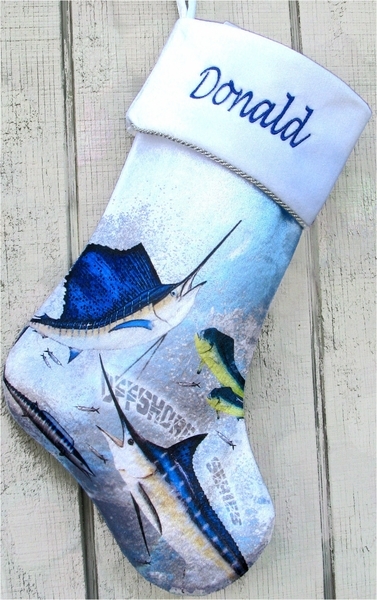 Fishing Christmas Stocking Design: Saltwater offshore series - we can personalize this stocking with a name or with a Title and Name of the recipient! How about Capt. Daddy! So if you have off-shore fishing lover in your circles, this stocking is for them. We offer free embroidered personalization. Materials and Design: The body and cuff of this Christmas stocking is made out ot velvet and the silver twist rope ribbon is constructed from metallic silver to frame the cuff. The velvet is printed with a design as shown. The inside lining is in matching color satin. The stocking is also padded inside between the lining and the exterior velvet, which gives the stocking soft feel, it holds its shape very nicely - just a superior quality workmanship!